Hi Windy and welcome to the site! 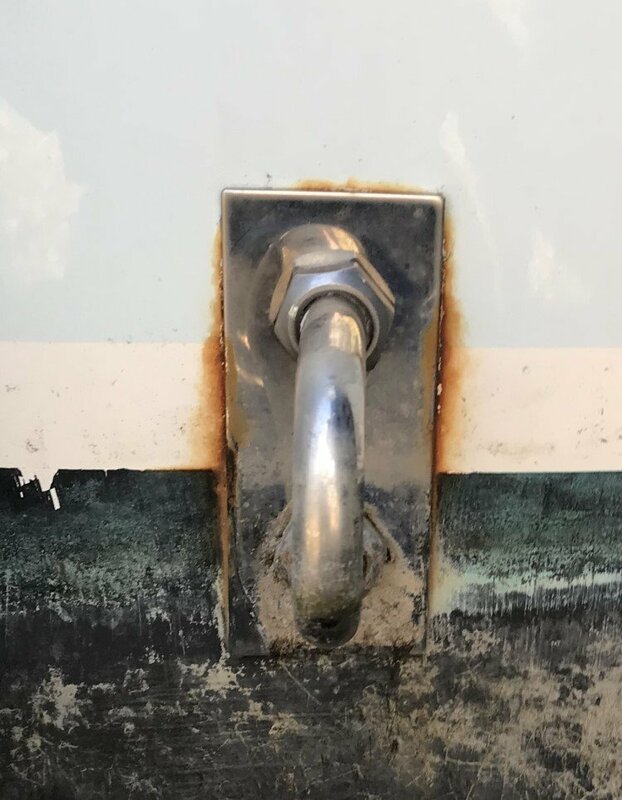 Sorry to see those rust stains, especially on a new boat. I am not sure where the factory sourced those u bolts from, but my suspicion that is not 316 stainless or 316 with some impurities. Good chance the corrosion is only along the edges of the backing plate where it was cut from a larger stock sheet. You can ask your dealer if this would be considered a warranty item, but I kind of doubt it. Or, if they balk at replacing it, see if you supplied new ones would the dealer swap them out. If they agree to that, get the new hardware from Gemlux. As to what to do with the stain, I would try some rubbing compound on the fiberglass, then wax. Make sure the stainless plate gets waxed, too, to help keep the salt water from the metal. An alternative would be to run a bead of marine sealant around the plate, but that should have been done when they were installed.